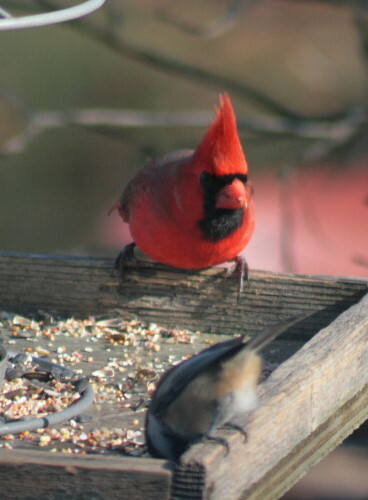 For the past month or so now we’ve been graced with the presence of a bright male Northern Cardinal at our feeders. Dan spotted it first, and I happened to be on the phone at the time. He was gesturing for me to look out the window, but the cord wasn’t long enough for me to see the feeder, and I couldn’t tell what he had spotted. When I got off a couple of minutes later, I came over to see what he was looking at. I was just as excited as he was to see the bird. 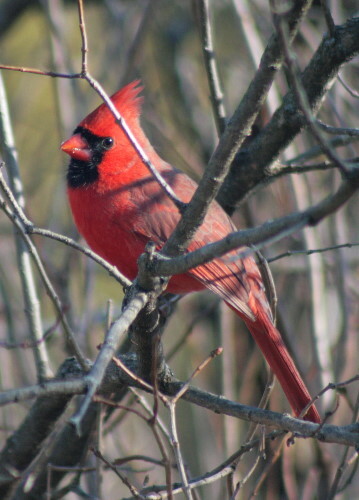 It’s funny to think of being excited over a cardinal, when back in the Greater Toronto area where I spent the first 28 years of my life they were a very common bird, and one of the first that a country girl learns to identify at the family’s feeders. Their distinctive metallic chink call is commonly heard in the shrubs while out walking. They’re regularly encountered in urban subdivisions, and they’re one of the first birds to be heard singing in late winter (or sometimes even mid-winter, for a particularly enthusiastic individual). 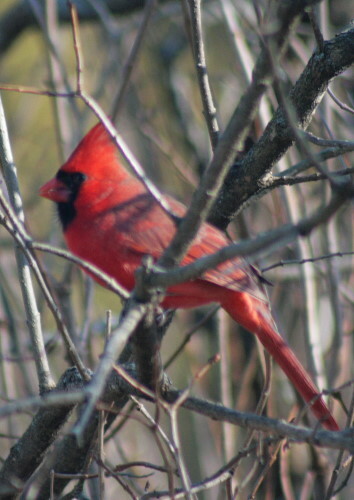 But out here in eastern Ontario, cardinals are a bit of a novelty. Since moving away from Toronto I have encountered a total of three individuals (not including ones I’ve seen on trips back to the Big City). We had two females (or maybe the same one on two separate occasions) visit us last winter at the lake house. And now this winter we have this lone male coming to our feeders. 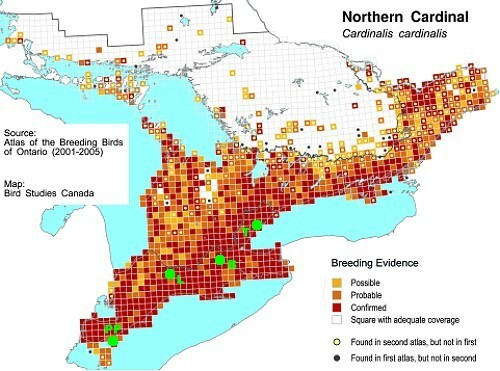 This map was borrowed from the Ontario Breeding Bird Atlas’ website (which allows you to use the data there for non-commercial purposes with attribution). It shows the combined data from the 1981-85 and 2001-05 Atlases. Squares where the species was recorded in the most recent Atlas are coloured in according to the highest level of breeding evidence obtained in that square. If the species was recorded in both Atlases, there is no dot; however, if it was new for the 2001-2005 Atlas there is a yellow dot, and if the species was recorded in a square in the first Atlas but not found in the second, there is a black dot on a white square. As you can see, there are a lot of yellow dots. They’re mostly along the northern edge of the bird’s range: the Bruce Peninsula and Manitoulin Island, along the north shore of Georgian Bay, across the southern edge of the Shield, and through much of eastern Ontario. I’m sure this represents a statistically significant shift in range boundaries, and although I recall seeing the data at some point when I was working on the publication staff for the Atlas, I don’t seem to see it in the book. The author of the Northern Cardinal account does note, however, that the northern boundary of the Northern Cardinal’s range is approximately the same as the isotherm (the imaginary line connecting the dots of different places with the same temperature data) for the January mean minimum temperature of -16°C (3°F). That suggests that the coldest cardinals are able to tolerate is an average January overnight temperature of -16. In places where the average is colder, you’re not going to find many, if any, cardinals. Now, cardinals haven’t become any more cold-tolerant in the last twenty years. Rather, the isotherm has shifted north and east as global temperatures warm fractionally. 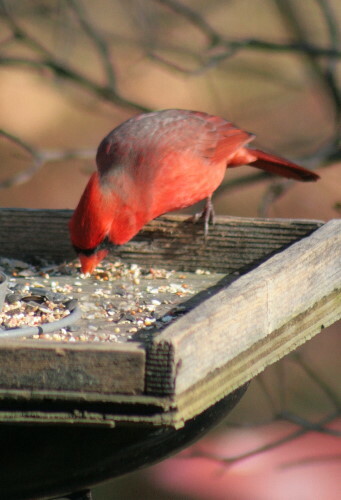 Combined with the abundance of birdfeeders that are now commonplace across much of North America, the cardinal has expanded its range dramatically over the last century. The very first record of the species in Ontario wasn’t until 1849, and the first recorded nest wasn’t found until 1901 at Point Pelee in far southwestern Ontario. It didn’t take very long for the bird to spread, however. By 1915 it was recorded nesting in London, in Brantford by 1919, and in Toronto by 1922 (marked on the map above by green dots and the first letter of the city’s name). That’s pretty quick progression! Of course, a nest record doesn’t make the bird common, and it’s too bad that the atlas doesn’t offer the abundance maps online. Though the bird was found in Ottawa even by the last atlas, its numbers are pretty low outside of southwestern Ontario. Its areas of greatest abundance remain the relatively warmer areas around Windsor, the Golden Horseshoe (from Niagara wrapping around Lake Ontario to Toronto) and surrounding cities, and an more isolated patch near Ottawa. Cities tend to have warmer temperatures than the rural landscape surrounding them, and they also have a higher density of birdfeeders, which means that overwinter survival is easier for the birds. In these population centres, abundances as recorded through point count surveys suggested some areas may have as many as 17+ birds per 25 point counts (each 10km x 10km square [approx 6mi x 6mi] contained 25 counts on average, scattered randomly). So essentially, stop anywhere in these regions and there’s a nearly 70% chance you’ll hear a cardinal. Getting back to our cardinal. Our region recorded between 0.01 and 2 birds per 25 point counts – the lowest the scale goes before you get to zero birds per 25. That means that there’s a less than 8% chance that at any given stop you’re likely to hear a cardinal. They’re around, sure – but not very common at all. Our particular area seems to be near the zero end of that range. Our home is close to the corners of four squares; of the 84 total point counts completed in those four squares, a cardinal was recorded on only one. Two of the four squares never saw a cardinal at all, on point count or off. This probably relates, once again, to the harshness of the winters along the edge of the Shield and surrounding areas, and the relative paucity of feeders compared to in the city. I admit I haven’t been scoping out the neighbours’ yards, but nobody has a big feeder array prominently displayed at the front of their house, in any case. With the number of birds who spend the day here I wouldn’t be surprised if we were the only home with feeders in our immediate vicinity. So I’m glad the cardinal found us – he might be the only one for kilometers. Perhaps he’s a young bird dispersing from a nest some distance away, which would explain why he’s not accompanied by a female, since cardinal pairs usually (though not always) remain together year-round. The other possibilities might be that his mate died, or he’s among the small percentage of birds who dissolve the pair bond over the winter. There’s no way to determine his age at this point – by late fall male cardinals have acquired their bright orange beaks and red plumage, having grown a completely new set of feathers from the ones he grew in the nest (relatively unusual among songbirds, the majority of whom replace body but not flight feathers in their first fall). He sure brightens up the feeders when he arrives! 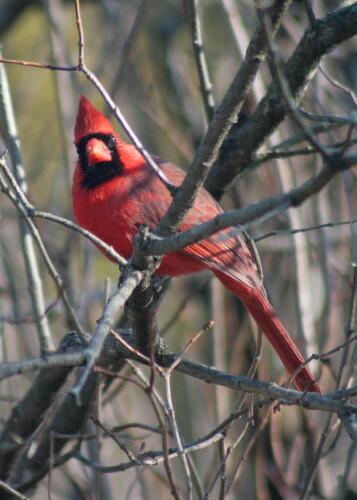 I’m in the Quinte region of Ontario and we have cardinals visit our garden on a regular basis … both male and female, and sometimes 2 or 3 pairs at a time. No matter how often we see them we always get excited when they arrive and rush to the window to look at them. They’re just such striking birds, eh? It’s hard for them not to catch your eye when they arrive. It looks like they’re a little more common down in Quinte area than they are here, but still not nearly as much so as in the GTA. We have no cardinals in CA. I have seen them in KY. Yours are spectacular. I am so glad you shared them. The fluffy fanny feathers of the chickadee are sweet, too. Wow, what a treat to see cardinals! Thanks, Gayle! You have many other species I would love to have, though – quail, for instance! I’m glad I don’t take cardinals for granted. If I did, now I’d feel bad! This is very cool research, Seabrooke. It’s interesting in what it reveals about the birds as well as what it reveals about the weather. And your photos are marvelous! He’s quite a handsome fellow. I could never see a cardinal as anything other than magical. Each one I see is like seeing the species for the first time. Thanks, Jason! I love delving a little deeper into the science and stories of species, there’s so many neat things to uncover. I have seen Cardinals on almost every morning here in London ON, but I find it so hard to photograph them! Male are rather conspicuous, and I have seen the female just once. This is great documentation! Thanks, Ani! They can be a challenge – of course, that’s true of most birds! Most of my photos never produce much. Keep at it and good luck!